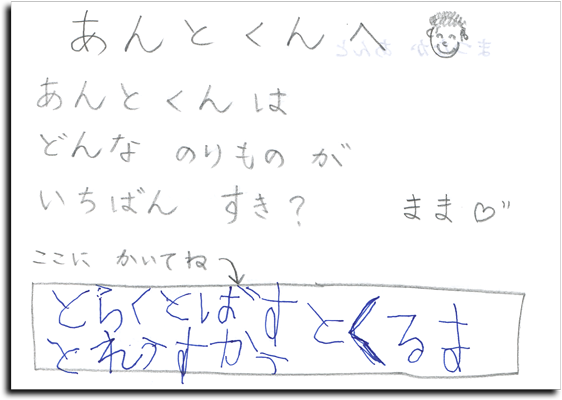 I mentioned in Anthony's First All-by-Himself Letter a few days ago that while writing his first full-fledged note all by himself, he'd made a grammar mistake in writing the わ sound as わ when, due to its grammatical use in the sentence, it should have been written as は. The alphabet is remarkably regular, with only a few special rules like this. Few as they are, they need to be learned and absorbed, so we lightly mentioned it to him in passing. 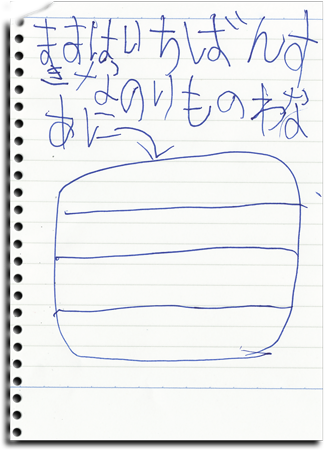 I didn't expect it to be something that he really “got” for a while, but he wrote it properly in his note the next day, seen at right. Your favorite kind of vehicle would be what? I translated のりもの as “vehicle”, but there's got to be something better. Imagine a book for little boys named Cars, delivery trucks, rockets, busses, cranes, bulldozers, police cars, planes, motorcycles, dragsters, race cars, bicycles, and more!. In Japan, that would be titled “Vehicles” and every little boy hearing that title would grow wide-eyed in expectation. What kind of vehicle do you like the most?